BBC facts and figuresfrom the Lebanon conflict. Seems like blatant propaganda to me. Notice the percentage for Lebanon is of the TOTAL POPULATION displaced. Whereas when we look at israel its the percentage of the NORTH TOTAL POPULATION. So we have two percentage figures which at a glace make it look like there was a bigger factor of population displacement in Israel 50% compared to a Lebanese 25%. If this isn’t BLATANT manipulation of statistics i don’t know what is…. With a total population of 7,100,000 the figures should be 7% Israelis displaced 25% Lebanese displaced. Interesting that the Israel defence force has stated its figure of dead soldiers as 116, no questions asked. But Hezbollah’s figure is questioned. My understanding is that Hezbollah can’t hide its figures because each dead guerrilla has to have a martyrs funeral and is celebrated by the community. I do believe the figures were higher than 55 according to the Lebanese paper “The Daily Star” they announced 91 dead (1). Certainly the figure of 550 49% guerrilla deaths seems highly dubious. Its also strange how the high figure of Israeli soldiers dead is placed next to the high figure of total Lebanese dead, while the lower figure of Israeli civilians killed is next to the lower figure of Lebanese fighters killed. These figures include “treated for shock” quite a large number, added with the other Israeli statistics comparable to the Lebanese total of 3,690, a figure which has no explanation, but I presume this covers mainly serious casualties. Do we compare 3,690 with a total of 2675 or with 690 or 76 or 32 injured? 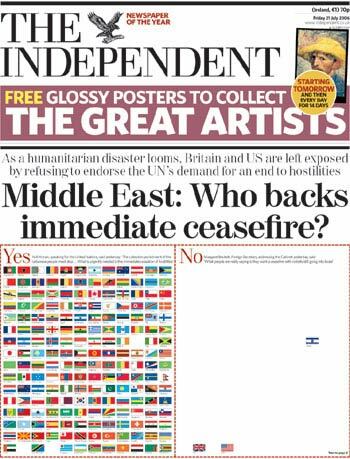 Personally I think we should add “needed treated for shock” to Lebanon, which is 4 million or more, considering the entire country was destroyed. Or a mathematical comparison 690 injured with 1985 shock victims (presumably all caused by the same attacks) so 3,690 should have created a hypothetical 14,305 Lebanese shock victims (basic scaling of the figures). This seems to give a fairer representation of munitions used by either side. However I have read that Israeli damage reports were over-blown, in that broken windows were reported as damaged buildings whereas Lebanese statistics were of significant damage, they didn’t have to lie, the figures were shocking enough already. However don’t take my word for it, I might be wrong as Ive not researched if the 300 figure is incorrect, I merely suggest it might be worth looking into, especially since its an Israeli Government figure. The number of rockets fired at Israel is being compared to the number of air strikes that hit a target in Lebanon. Target being defined by the Israel military. If we compared with the number of Hezbollah rockets that “hit a target” it would probably be under 300 considering that’s the number of properties damaged by rockets in this BBC report. The rockets being very inaccurate. I don’t particularly want to make the Hezbollah attack on Israel look less horrific by doing that, but neither do I expect the attacks on Lebanon to be trivialised in such a manner. If you going to compare stats you have to compare Hezbollah rockets launched with Israeli bombs dropped / rockets launch / artillery munitions fired / cluster bomb (landmines) left. At the very least, this might be slightly meaningful. If anyone wants to do that I’d be interested in the results, but i don’t have the time myself. 70% of business closed in NORTHERN Israel. How does this compare with the 34 days of embargo on ALL of Lebanon’s seaports, airports and the destruction of nearly all roads and bridges? What percent of business is effected by this? 100%? Id like to see like-for-like statistics, is that too much to ask? Interestingly the Israeli damage costs are $1.1 billion when the same site states 300 properties damaged, and Lebanon’s $4 billion with 15,000 houses, 900 factories etc. That’s 25% of the money to rebuild 1.9% of the damage. As for the inclusion of military spending we can knock $2 billion (2) of that with the US military aid given to Israel. Or perhaps we need a third column for US expenses? 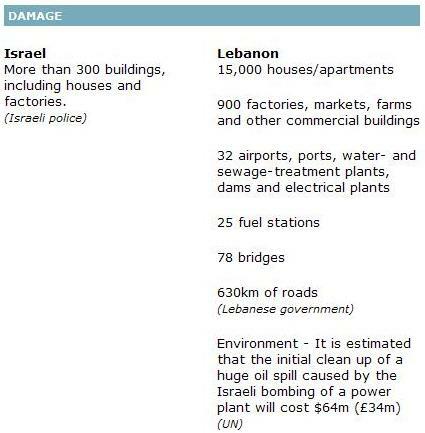 I don’t really see why is relevant to compare the cost of Israeli bombs to the cost of the damage caused by them. Surely the report should just compare damage with damage. But perhaps that might make it all too clear who the victim is. In my opinion, if statistics are to be placed side by side such as these were, to make a comparison, then some effort should be made to ensure like is compared with like. Coming from a maths background I find the method used illogical, I’d say this is either due to incompetence or there is a purpose. The fact that statistics appear to be selected to look a certain way, often trying to make Israel look better, suggests to me a complete bias in the compiling of the report. As for just accepting ANY government figures without question seems like poor journalism to me. The first rule of journalism should be 1. Governments lie. In most sections, the no.s are compiled from the respective sources Israeli police and military on one side and UN/Leb Govt on other side. 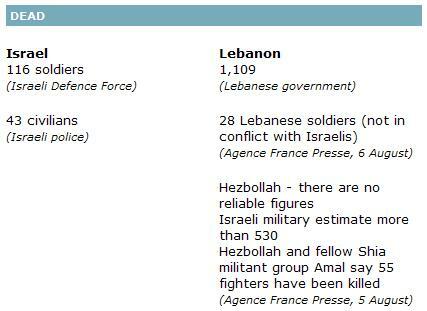 Israeli police figures for Israeli side and Israeli military for the Lebanon figures. Considering that the cluster bombs themselves amount to close to two million , adding up the actual figures might give something at a ratio of 1:200 or more, which is “too much” for BBC to publish. Also often when Hamas is mentioned BBC keeps reminding the user that they have conducted numerous suicide bombings in Israel and is committed to Israel’s destruction , while at the same time it rarely mentions that Israel has been illegally occupying the West Bank and Gaza strip for almost 40 years now and has often conducted massacres like the Gaza beach massacre and the Beit Hanoun one. 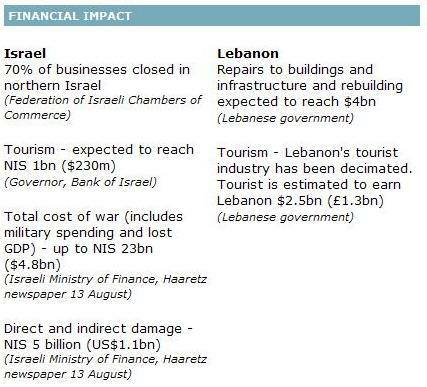 BBC facts and figures from the Lebanon conflict. Seems like blatant propaganda to me.